This brochure is not currently available. Please check back again soon. India is one of the most colourful countries in the world, with Rajasthan at its epicentre. Despite being an essentially arid region, it shimmers with almost every shade in the rainbow. Dusty towns and villages are embellished with dazzling saris and vibrant local markets offer fruit, vegetables and a bright palette of spices. In addition, the state is dotted with numerous stately palaces – some more colourful than others – along with elegant havelis (merchant homes), temples and much more. This tour features some of India’s most stunning destinations, including the Taj Mahal, Udaipur, Jodhpur and Jaipur. In addition, explore off the beaten track to less known highlights such as the ancient towns of Karauli and Narlai. And, for lovers of wildlife, discover Ranthambore, one of North India’s largest national parks, with a growing Tiger population along with other animal and bird species. Explore Delhi's Old City before heading south to Agra and the incomparable Taj Mahal. Akbar’s wonderful deserted capital at Fatehpur Sikri, the Keoladeo Bird Sanctuary at Bharatpur and the 14th century town of Karaul, considered one of the holiest towns in Rajasthan. The world famous Ranthambore National Park; a vast wildlife reserve known for its tigers, leopards and marsh crocodiles. 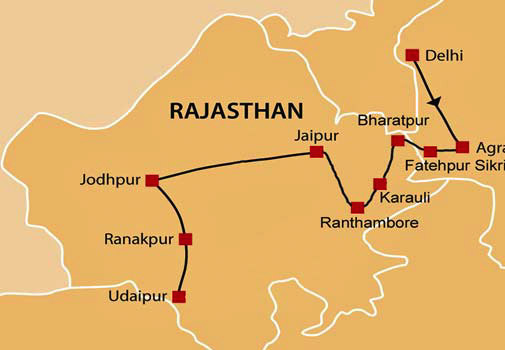 The fabled ‘pink city’ or Jaipur is one of the three ‘pearls’ of Rajasthan as well as the state capital. Jodhpur with its spectacular Mehrangarh Fort looming above the town. Sleepy yet spectacular, the Narlai village sits on an exhilarating back road where your stunning heritage hotel for the night was once a hunting lodge of the Royal family. The beautiful 15th century Jain temple at Ranakpur. Beautiful Udaipur, often described as one of the worlds most romantic places in India. Steve Mortimer heads up Byroads Travel and will be your host on this tour. 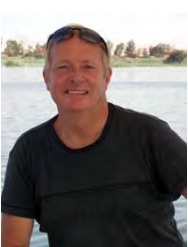 Steve has more than 30 years in the travel industry and has travelled to well over 120 countries. He has worked with a number of well‐known Australian and UK adventure travel companies including 13 years as a Product Manager and Operations Director for Peregrine Adventures. In addition to researching and developing holidays in many different regions of the world Steve has led a great number of trips to some of the world’s most interesting, exotic and out of the way places. Steve likes nothing better than getting out and about with like-minded travellers, sharing his knowledge and introducing them to some of the world’s most interesting places. With Byroads, you can be confident that your itinerary includes visits to all the ‘must see’ attractions – and much more, however there are some days when you’ll have time to wander and to make some of your own discoveries. Throughout the tour local guides are employed to provide a wealth of background information and share their extensive local knowledge. People who ordered Colours of Rajasthan, India also ordered the free travel brochures below. Click on the images to find out more about these brochures.